If you run an online business, blog, or in the process of a tech startup, then email marketing and building a subscriber list should be one of your top priorities. According to a recent research study conducted by GetResponse surveying 1,831 email marketers from around the world, they found that email marketing delivers the highest overall rate of return (ROI), so email marketing and list building can be one of the most profitable things you do. But, deciding which email marketing service or software to use can be a surprisingly difficult decision, especially if you’re just starting out. The reason it’s so hard picking and choosing what email marketing software or service to use is because of the vast majority of options available to you out there to choose from. However, it doesn’t matter if you’re a blogger, small business owner, or maybe even a freelancer – choosing the best email marketing software directly from the start helps play a crucial role in your initial success of your marketing campaigns and efforts. Today I’m going to go over with you each of the 7 best email marketing services and platforms for blogs and businesses here in this article, so let’s get started! Why is it so important for you to pick the best email marketing tool and service? It’s because for most people and small businesses, email is the one extremely effective marketing channel which they have full control and ownership over. It’s also cost-effective, simple to manage, and allows you to contact your followers, subscribers, and customers directly. Behavior-based emails have eight-times more opens and clicks and six-times more revenue than bulk campaigns. Business to consumer marketers using email marketing automation have high conversion rates of around 50 percent. Relevant email messages are 133 percent more likely to match a consumer’s purchasing cycle. When choosing a reliable marketing service try to make sure you pick one that’s known to have high quality service in the industry and has a proven track record. Failing to go with a reliable service can cause you to lose all your email contacts if the service ever stopped working or went out of business. It’s also important to remember that it’s the email marketing service that sends and delivers all of the actual emails to your subscribers. It also stores your email and subscriber list. Even if you use useful email marketing tools like OptinMonster or MailMunch which makes collecting email addresses and new subscribers easy and simple, the ultimate task of sending and delivering emails is the sole responsibility of your email marketing software and service provider. Not all email services are created equally and only a handful have the proven track record and credibility that you want from a email marketing service provider. 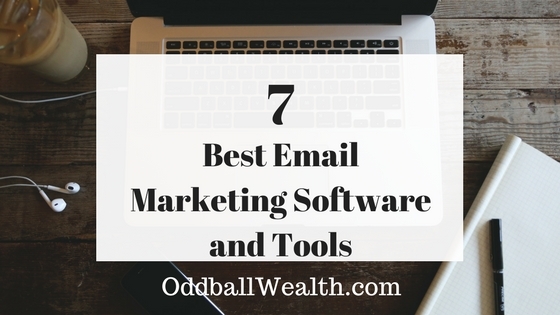 The top seven email marketing software and online service providers are listed below. The last thing that you want to do is overpay for a service that’s unreliable, has only a few features, and has poor email delivery. A good email marketing platform makes it easy for you to manage your contacts and subscribers. It provides the resources and capabilities for creating emails that catch readers attention and engaging email campaigns. Also, it allows you to monitor the performance, open rate, and success of your email campaigns. The best email marketing services and software ensures that the intended recipients see and review the email messages that you send. More importantly, they make sure your emails avoid ending up in a spam or junk folder. Now that you have a better understanding of why choosing a good email marketing service and software is crucial, let’s review the seven best email marketing software and service providers currently available and how they compare to one-another. Constant Contact is one of the best email marketing services in the industry. Over the last couple of years, it has become a star performer and one of the fastest growing and most used email marketing software and services. Their email marketing platform and dashboard is extremely user-friendly and easy-to-use for anyone, whether you’re an expert or a beginner just starting out. Managing subscribers, email lists, contacts, campaigns, and email templates is quick and easy to do. Users can quickly monitor, view reports of emails and campaigns, and track the success of each one. You’re provided with 1GB of storage space for storing your own files. You’re also provided access to a media library and exclusive social media sharing tools. They provide unbeatable live support, chat, email, community forums, and access to countless other resources. Constant Contact also provides great online training and live seminars which you can attend. They do this to help online marketers, bloggers, and small businesses learn the basics of email marketing, incorporate appropriate strategies, and build successful email campaigns. All the amazing features, perks, usability, support, and training puts Constant Contact at the top of our list as the best email marketing service for business and entrepreneurs. Constant Contact offers a risk-free (no credit card required) 60-day free trial! Start using it for free and if you like it, their services start at around $20 per month. Use Constant Contact for Free! GetResponse is an extremely popular solution for email marketing. It’s very easy to use and makes email marketing simple for entrepreneurs, small businesses, online marketers, and complete beginners. It has a bunch of helpful marketing automation tools to create automated marketing campaigns that convert and engage users. Use their drag and drop builder tool to quickly create amazing email campaigns, segment lists and email contacts, and send out content to specific groups. These easy to use tools allow you to create effective email campaigns to increase your revenue and profits. GetResponse comes with beautiful responsive landing-pages, forms, tracking, autoresponders, and A/B testing. It also easily integrates with third-party lead generation software like Google Docs, SalesForce, OptinMonster, ZenDesk. MailMunch, and many more. Customer support and assistance is available by email, live chat, and phone. They also provide a bunch of free learning material on their website including how-to’s, guides, videos, webinars, and many more useful resources which you can find in the help section on their website. GetResponse offers a 30-day free trial, and their pricing starts at only $15 per month. MailChimp is a highly popular email marketing service provider. They offer great tools, support, and have an easy-to-use interface. Connect your MailChimp account with hundreds of web services and apps to generate more revenue, streamline workflow, grow your business, and sync customer data. It easily integrates with WordPress, Shopify, BigCommerce, PrestaShop, WooCommerce, Magento, and many other services and platforms. MailChimp comes with several helpful tools, including autoresponders, merge tags, easy email creator, simple tracking and analytics, and segmenting email contacts into specific groups. You’re also able to set up target group segmentation based on location and set up email delivery times based on time-zones. Customer service and support is provided by live chat, email, and a huge data-base of helpful educational and learning resources including videos, guides, and how-to articles. MailChimp is perfect for beginners because it offers a completely free plan called the “Forever Free Plan” which lets you have up to 2,000 email subscribers and send 12,000 emails per month. Their paid plans start at a low cost of only $10 per month. Because of their forever free plan, MailChimp is the best email marketing platform for beginners and nonprofits. →→ Sign up for MailChimp by clicking here. iContact is one of the top email marketing tools for creating email campaigns and tracking your progress. One of the most popular features with this email marketing service provider is the ability to create, manage, and send out custom surveys. This amazing feature allows you to get customer and user feedback, and also encourages two-way interaction between you and your customers. This email marketing platform is suited for both experts and beginners because of their easy-to-use tools and variety of options which make growing your business simple. Once a user signs up (iContact offers a 30-day free trial) for this service, they’re able to send their first email within minutes. iContact offers professionally designed email templates, easy-to-use tracking and reporting, award-winning support, and extremely affordable plans for every budget. →→ Click here to start using iContact for free. Campaigner is yet another great email marketing service which allows businesses, bloggers, and entrepreneurs to quickly and easily create and send highly personalized one-to-one emails to subscribers, customers, followers, and fans. This allows you to build long-term relationships that lead to continued business growth and increased sales. Other great benefits of Campaigner is their exceptional value, 24/7 customer support and coaching, and extremely low price. As an added bonus by using this special link here, you can start using Campaigner email marketing software completely free for 30 days! →→ Start using Campaigner for free by clicking here. Mailigen is another online-based email marketing software which helps you create and analyze your email marketing campaigns. As a reader, you can start using this Mailigen for free by using this special link here! Sign up for free through the link and start building drip campaigns, view detailed reports and statistics, and use professionally designed email templates and automated workflows. →→ Start using this marketing automation tool free by clicking here. With SendinBlue business owners are able to automate their marketing efforts, use marketing campaigns to build and grow relationships, and transactional messaging. The user-friendly software also has a suite of email and SMS messaging services. The SendinBlue email marketing software does have a free version that allows you to have up to 9,000 subscribers, but you’re pretty limited with everything else. Their paid plans start at $7.37 per month and let you have up to 40,000 email subscribers. Connections and always staying in touch with your list is one the main key to a successful campaign regardless on which tool you are using. It was nice that we have this list and I am sure there are more out there that we can use for campaigns. Very true! Having a email list and subscribers is useless unless you’re staying in contact with them consistently! Awesome list! I wonder if there are more platforms out there because I am doing a thorough research about it. I am looking for fresh and packed with features for a marketer like me. Like active campaign or activetrail. I am currently using activetrail and so far, the social media integration was awesome plus the sms gave better results. Hey Peter, thanks for your comment. Yes, I do believe there are quite a few other email marketing platforms available out there, so it’s definitely a good idea to do your research. I never heard of activetrail but I’ll have to look into them. However, with all the research I conducted, experiences I learned from other marketers who’ve also used these marketing services, and from my own personal experiences trying and using all seven of the email marketing software companies listed above in my own businesses; I’ve found that these services are the best for marketers based from their customer support, user-friendliness, tools and features, and pricing. One other really nice thing about all seven of the email marketing services and platforms which I listed in the post above, is that most of them all offer a completely free trial period. So, you can try each of them out for yourself, compare them, and see which of them you like the most and work the best for your business risk free, without spending any money! Getresponse seems like a good one. I’d definitely like to try their marketing automation. Getresponse is a great email marketing service! I especially like all of their professional looking opt-in page templates, and also how quick and easy their platform allows you to create a professional looking opt-in page and instantly begin collecting email addresses! Hey…! this email list is awesome and i am also search like this for our blogs, so this marketing service for good our business. Thanks so much for sharing ! I am also having business of software testing and from many days I am not getting the leads from email marketing. but by reading your blog there is some hope light up. I will surely follow this and get back to you. Good information, Tyler. Email list is one of the best strategies to develop a following and to engage with clients. Glad you included MailChimp, I’ve had it for quite some time and it’s definitely easy to use, easy to integrate with other platforms and it’s free. Checking out other sources here. Thanks for the share! Hey Nancy, I’m glad you found the article informative. Email really is one of the best strategies, as it allows you to connect and stay in touch with your audience directly. And of course, I had to include MailChimp! Thanks for the Post!! We can say that act of sending a commercial message, typically to a group of people, using email. In its broadest sense, every email sent to a potential or current customer could be considered email marketing. Great and very informative post about email marketing! I’ts very important to note that you give good value to your readers. You will be able to earn their trust and in return, you will get more sales from it. I also had to include Mailchimp! That’s the one I use. Emailing is a crucial marketing strategy in digital marketing for every industry. It is a great platform for the ROI (Return of Investment). Thanks for sharing the great email marketing automation software. IMO Autopitch is also one of the best email marketing software for email marketing. It is a cold email & sales development automation tool for the small & medium size business. Thanks, Tyler for the great insight.